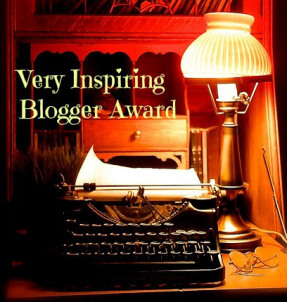 Thank you to LifeasIinterpret@wordpress.com for nominating Ninasusan.com for the “Very Inspiring Blogger Award”. It’s an honor to be nominated by a blog who writes the most touching and beautiful posts about life. I highly recommend you pay Life as I interpret it a visit! Nominate ten (10) bloggers you admire and inform them of the nomination. 1. Isanybodyhear.com Very popular blogger, Tracy, supports and educates her friends on life and living with cancer. 3. Transvestiterabbit.wordpress.com I have been following her thru her Xanga days. I love her irreverence and telling it like it is. 4. Bardoinbetween.wordpress.com She is writing a very dark blog right now to match her very dark life. I always hope tomorrow will be better for her! 5. Welcometodementialand.wordpress.com I share her blogs on my Facebook page and she has many followers from folks with dementia and those who love folks with dementia. 9.kissedbyadog.wordpress.com another xanga blogger – I’ve seen the dark side and gone thru the tunnel with her to see the light. I am flattered by this. You are too kind. Thank you for nominating me. I am glad you find my blog helpful in some way. I like to read yours too. Difficult paths are better walked with someone who has been there or someone who has some level of familiarity with the challenges.Thank you for making me feel I am not alone. I can see why; I read one post and I am hooked – seems like a frustrating story but very strong woman. I am assuming you asked me? I had not heard about Tracy but now I am looking at the website..
do you know or visit Tracy at isanybodyhear.com? She is an inspiration and gives me a different angle for my life lense!